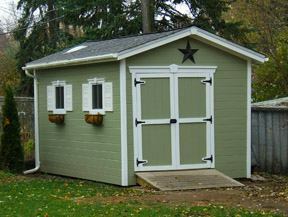 Pictures of this classic gable shed were sent in by Secrets-of-shed-building.com reader Tim Brummett from Illinois in the United States. "I have enjoyed your site very much....I wish I would have come across it BEFORE I designed and built my shed last year. You have tons of great information here! Thanks so much for sharing! I particularly like the keystone architectural treatment to the gables and door & window trim as well as the green siding/white trim scheme with shutters.....it matches our house and I think it's a classic looking garden shed. 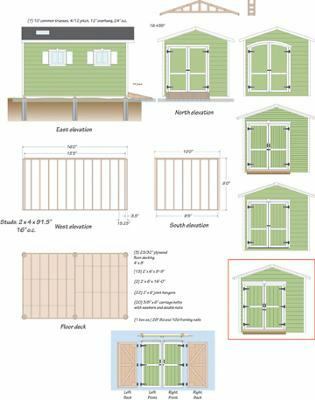 I have already built the shed using the plans I drew up in Adobe Illustrator and thought you might like to see it." It is interesting to see the varying door styles Tim tried before the solution he finally adopted.